The album art player has also been around a long time, but it too has been revamped in iTunes 11.0.3 to include some more functionality, like the ability to AirPlay songs and provide direct access to Up Next. Both options provide for a much smaller screen footprint of iTunes, and if you’re overwhelmed with desktop window clutter they’re pretty great to help ease the mess and focus on work again. You can now add album art to the “Songs” view, which is usually the default view and shows a simple list of all songs. 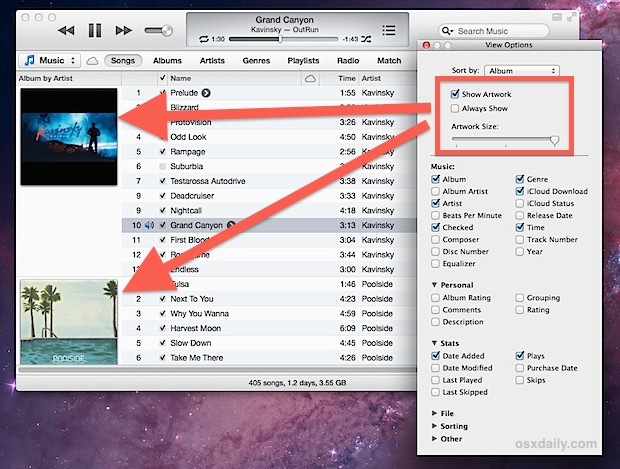 By adding album art you can spruce up the appearance a bit here, and you can even adjust the size of the album art. To get the most out of the revised MiniPlayer and album art song view you’ll want to be sure you have as much album cover art in your library as possible. You can go through the process of filling in artwork yourself, or better yet, let iTunes do it for you, which works very well, even with obscure albums, so long as music in your iTunes library is well labeled and has appropriate meta data. The multi-disc albums is fairly self explanatory, and is only relevant to album collections that span multiple discs, like anthologies and greatest hits collections. This groups the entire album together as a single album, rather than showing them as separate albums. •	New MiniPlayer. MiniPlayer now includes a beautiful new view that showcases your album artwork. In addition, a progress bar is now built right into MiniPlayer. •	Improved Songs View. You can now enjoy your album artwork while in Songs view. •	Multi-Disc Albums. Albums with multiple discs now appear as a single album.